As the App Store grows, it’s becoming tougher to find the true gems, particularly in the overloaded games genre. I took a look at four iPhone puzzle games with unique approaches—and found a couple worth a spot on your iPhone, and a couple that you can safely ignore. The first puzzler I tried was Squism, a $5 game from AggroPanda with a free Lite variant. It’s clever, challenging, and maddeningly addictive. 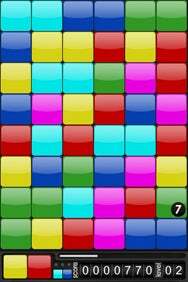 You’re presented with tiles of several colors arranged in an 8 x 6 grid. The game displays two colors in the bottom corner, and you can remove any number of adjoining tiles that match either of those colors by dragging across them. You can’t undo your dragging, and you can’t drag back over a path you’ve started. Squism is easier to learn than to describe (as the lackluster help text proves), and it’s a lot of fun once you get it. What makes the good game pretty great is the variety of gameplay options: You can choose to race against the clock, to play until there are no legal moves left, or even play an endless variant. Quadrati, another $1 puzzler with a free Lite version, comes from Bang Tick Boom Productions. Like Squism, it feels familiar but with a twist all its own. Unlike Squism, though, the fun in Quadrati simply doesn’t last. 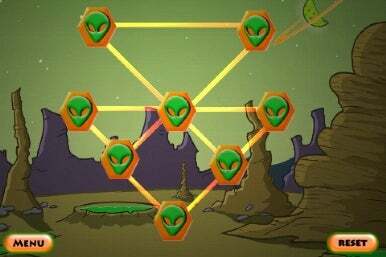 Each puzzle in the game consists of a series of connected lines. You can tap on a connection between two lines to destroy one of the lines, and the icon itself is destroyed when no lines are attached to it anymore. Your goal is to eliminate all the lines. It’s tricky, and it’s certainly a good challenge. But I found that once I’d done a bunch of the puzzles, new ones felt more like a chore than entertainment. Even though new puzzles get progressively trickier, tapping on lines just felt increasingly repetitive. Struck, a $3 game also with a free Lite counterpart, is offered by Art Whirled. It’s a fascinating and complex puzzle game with two unique modes. The single-player version is a true puzzler, presented on a black-and-white grid. You have a finite matter of turns to navigate your token to the goal. Valid actions are limited moving your piece in a straight line across similarly-colored pieces, toggling the color of your piece, or toggling the color of a square on the board. Fortunately, the game includes a patient tutorial that steps you through its intricate rules. Once you’ve mastered them, there are oodles of puzzles to work through solo. Interestingly, though, Struck’s main focus is as a two-player game, both via pass-and-play and (in the premium version) online. The two-player rules are a bit different, involving moving your piece from one of the board to the other before your opponent can. I actually found this mode less enjoyable than the solitaire version. The single-player mode is included in the free version of the app, so I’d recommend that you start there. The last puzzle game I checked out was Doodle Bomb. And frankly, it was a tough one for me to review—but only because I really didn’t want to stop playing. The $2 app from Bottle Rocket is absolutely excellent. 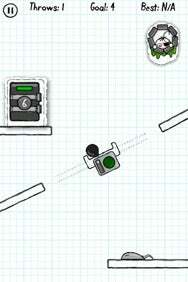 In the “hand-drawn” style that’s remained popular on the App Store, the game requires you to precisely fire bombs around different obstacles, with the goal of unlocking a door on each level. How close you tap to the virtual cannon directly impacts your bomb’s trajectory. You need to place your bombs as precisely as possible to trigger moving platforms, move obstructions, and such—and your goal is to do so with as few bombs as possible. After tossing a bomb, you can tilt the iPhone to nudge your bomb closer to its target. It’s quick to learn, and deliciously fun and engaging, mostly because the physics are so perfectly implemented. My sole complaint is that I want more: The game contains 40 “regular” puzzles, and 25 additional “master” puzzles. Most puzzles can be solved pretty quickly, and even the hardest ones take mere minutes. I want more puzzles—but I can’t deny that I love the ones I have.